Trevor has been seizure-free since September 2006. He was homeschooled during his junior and senior years of high school so he could train with his coach, Tim Seaman of San Diego, Calif., a two-time Olympian. Having graduated in June 2010, Trevor remains under Seaman’s guidance, racewalking an average of two hours daily. Racewalking requires a type of “strut” that may appear odd to one not familiar with the sport, and although it has not caught the collective interest in America, it’s widespread in Europe, L atin America, Russia, and China. 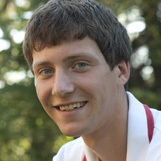 Racewalking has allowed me to make friends all over the world,” said Trevor. “These opportunities are priceless and are what makes the sport so valuable to me.” Most recently, Trevor traveled to Italy to train with friends and competed in his first serious 20-kilometer competition in Finland. 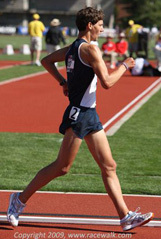 His time beat the Olympic qualifying standard, though the qualifying period for the Olympics does not start until 2011. Trevor’s soft-spoken manner does not give way to the fierce determination that lies underneath. Perhaps this is exactly what fuels his success—channeling his energy to all the right places.